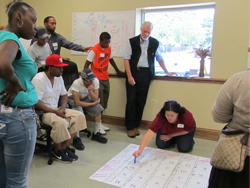 CHAMP (Congregational…or sometimes Community…Health Asset Mapping Partnership) is is an “asset-based” process that engages a range of people in the community to identify what is already working, where good is happening, how love is being expressed, what is beautiful. Faith communities are a core group in the process, but CHAMP pulls in community members, service providers, and other stakeholders to create a picture of the community and how it functions. We learned about this process from colleagues in Southern Africa who developed it to help governments see how people of faith were already tending to those with HIV/AIDS in their communities. Since it was first used in 2006, this process has been used throughout the world to quickly and effectively get communities talking to each other and moving forward to take action together. CHAMP Workshops provide a way for communities to make visible what is alive and working in their communities and create concrete steps to build and expand those spiritually powerful assets. 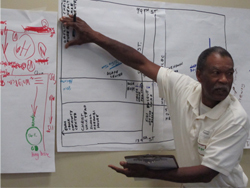 CHAMP Workshops help participants quickly get to the heart of an issue and build consensus about how to move forward. 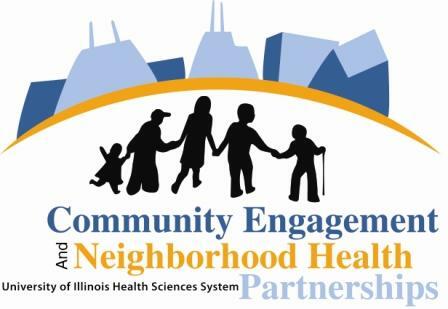 CHAMP Workshops bring new voices to the table, generate energy, surface critical issues, and identify powerful assets for improving community health and well-being. This workshop brings together 20-30 community members, such as single parents, youth, block club leaders, elders, men, women, members of diverse faith groups, etc. Ideally this group should be diverse, and should include people who may not normally be at the table. The Service Providers group is for anyone who provides a service in the community. This could include businesses like barbershops and restaurants, social services, political groups, schools, or park districts, etc. The Health Provider’s group is for 20-30 participants. The Faith Leaders group is made up of pastors, rabbis, imams, priests, etc.. The Faith Leader’s workshop should bring together leaders from across the diversity of the community’s spiritual traditions. The fourth workshop brings everyone together to receive a report from all three group processes, see where there is overlap and where there are gaps, and form an action plan. All workshops are designed to be all-day meetings from 9 a.m. to 3 p.m., but can be adapted to be shorter if needed. CHAMP facilitators plan and carry out the workshops in partnership with a Convening Community Organization that wants to bring in the CHAMP process to further their work (that’s you!). CHAMP partners gather and analyze the information that is generated during the workshops and provide a comprehensive report to community leaders. However, it is up to the you to take the outcomes of the process and continue to engage the community in addressing what is raised. The CHAMP process works whether you are starting from scratch or if you already have an issue you want to address. It’s up to you to decide whether you want to focus on an issue or use the CHAMP process to help decide what issues need to be addressed. We look to you to bring the community stakeholders together to make sure there is buy-in and support for the CHAMP process. Administrative fee to The Center for set-up, recruitment of CHAMP facilitators, and management of project. Staff time from your organization to engage the community stakeholders, recruit workshop participants, manage the logistical details of finding space and ordering food and support the final action plan.